Trailers are usually the best part of the movie going experience. They play like a highlight reel for the films they advertise. They sometimes even function as a more economical mode of storytelling than the main feature itself. That’s the one thing that both mainstream rap albums and summer blockbusters have in common. Both are preceded by tons of advance hype. These marketing campaigns are often more engaging and entertaining than the final product. If one rapper has consistently tried to be the rare exception to that unfortunate rule over the years, it’s been Nas. His tenth studio album, Life is Good, is rightfully one of this year’s most anticipated releases. The cover art for it was finally released today. It shows a rather pensive Nas sitting in a club with a green dress draped across his lap. It’s a rather curious image that would’ve surely been the source of much debate, if not for the trailer that accompanies it. The clip is a montage of film footage compiled from various music videos, newscasts, documentaries, and concerts. The unifying theme is, as expected, Nas himself. There is a strong emphasis on his financial and personal troubles as of late. It ends with a snippet from his “VH1 Behind the Music” episode, where he explains the mystery of the green dress. This suggests that his divorce from Kelis will loom large over the album. It also suggests that the title might be a touch ironic and/or sarcastic. 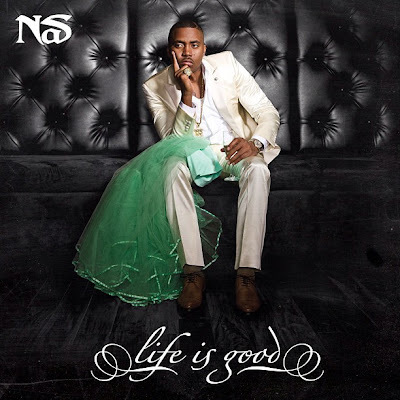 Could Life is Good wind up being Nas’s version of Here My Dear? If only we could be so lucky. I don’t envy the troubles Nas has had to face over the past few years, but personal pain often yields great music from gifted artists.